d i v e r s i t y w o m a n . c o m Fa l l 2 0 1 7 D I V E R S I T Y W O M A N 61 e Mt Powerl Women inCorporateAmerica 382. Erie Insurance Group Lorianne Feltz, CPCU, Executive Vice President, Claims and Customer Service 383. Tla 384. Ascena Retail Group** Sue Ross, Executive Vice President, Corporate Affairs and Media Rela- tions Stacy Lynn Turnof, Vice President, Investor Relations 385. Darden Rtaurants Susan Connelly, Senior Vice President, Communications and Corporate Affairs Sarah King, Senior Vice President, Chief Human Resources Officer 386. Harman International Industri Sandy Rowland, Executive Vice President and Chief Financial Officer Paula Davis, Vice President, Corpo- rate Affairs and Communications and Chief of Staff to the CEO Marisa Iasenza, General Counsel and Corporate Secretary Roopa Unnikrishnan, Vice President, Strategy, HARMAN and Connected Car at HARMAN 387. Nvidia Colette Kress, Executive Vice Presi- dent and Chief Financial Officer Debora Shoquist, Executive Vice President, Operations 388. R. R. Donnelley & Sons Sheila Rutt, Executive Vice President and Chief Human Resources Officer Deborah Steiner, Executive Vice President, General Counsel, Chief Compliance Officer, and Corporate Secretary 389. Fih ird Bancorp* Julie Hughes, President, Pennsylva- nia Region Angela Cecil, Vice President and Commercial Relationship Manager Rose Crump, Senior Vice President, Commercial Banking Divison Amy DeBaltzo, Vice President and Business Development Officer Julie Dunn, Senior Vice President and Affiliate Mortgage Manager Louise J. Gissendaner, Senior Vice President and Director of Commu- nity Development Elizabeth S. Kollar, Senior Vice President, Mortgage Lending Karen Mundy, Vice President and Head of Affiliate Consumer Lending Jill Sandilla, Senior Vice President and Manager Teresa J. Tanner, Chief Administrative Officer and Executive Vice President 390. Quintil IMS Holdings Marla Kessler, Senior Vice President, Strategy, Marketing and Communica- tions Trudy Stein, Executive Vice President and Chief Human Resources Officer 391. Jon Lang LaSalle Mary Bilbrey, Chief Human Resourc- es Officer, Americas Jill Kouri, Chief Marketing Officer, Americas Ryndy Ditmars, Global Litigation Director, JLL, and General Counsel, JLL Americas Suellen Ravanas, Chief Financial Officer, Americas 392. Dover Carrie Anderson, Vice President, Controller Ivonne M. Cabrera, Senior Vice President, General Counsel, and Secretary 393. Spirit AeroSystems Holdings Stacy Cozad, Senior Vice President and General Counsel Krisstie Kondrotis, Senior Vice Presi- dent, Business Development and Business & Regional Jet Programs Michelle J. Lohmeier, Senior Vice President and General Manager, Airbus Programs Sam Marnick, Executive Vice President and Chief Administration Officer 394. Ryder System Karen Jones, Executive Vice Presi- dent and Chief Marketing Officer 395. A-Mark Precious Metals Carol Meltzer, Executive Vice Presi- dent, General Counsel, and Secretary 396. Tractor Supply 397. Sealed Air Susan Edwards, Vice President, Hu- man Resources Dr. Ilham Kadri, President, Diversey Care Carol Lowe, Senior Vice President and Chief Financial Officer 398. Auto-Owners Insurance* Eileen Fhaner, Chief Financial Officer, Senior Vice President, and Treasurer 399. Yum China Holdings Joey Wat, President and Chief Oper- ating Officer Shella Ng, Chief Legal Officer Christabel Lo, Chief People Officer Sunny Sun, Chief Growth Officer Angela Ai, Chief Development Officer Alice Wang, Senior Vice President, Public Affairs 400. Calpine Hether Benjamin Brown, Senior Vice President and Chief Administra- tive Officer Shonnie Daniel, Senior Vice Presi- dent, Deputy General Counsel and Assistant Secretary Sarah Novosel, Senior Vice Presi- dent, Government Affairs 401. Owens-Illino Jan Bertsch, Senior Vice President and Chief Financial Officer MaryBeth Wilkinson, Senior Vice President, General Counsel, and Corporate Secretary 402. Targa Rourc 403. JetBlue Airways Joanna Geraghty, Executive Vice President, Customer Experience 404. Jon Financial (Edward Jon) Lisa Dolan, Principal, Finance Kristin Johnson, Principal, BOA Tal- ent Acquisition and Performance Penny Pennington, Principal, Client Strategies Group 405. Franklin Rourc Jennifer M. Johnson, President and Chief Operating Officer 406. Activion Blzard 407. J. B. 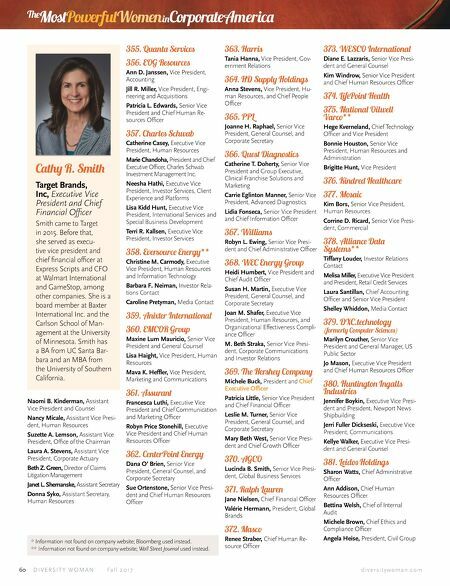 Hunt Transport Servic Shelley Simpson, Executive Vice President, Chief Commercial Officer, and President, Highway Services 408. Constellation Brands 409. NCR Andrea Ledford, Executive Vice President, Chief Administration Officer, and Chief Human Resources Officer Ruth Fornell, Senior Vice President, Global Professional Services 410. Asbury Automotive Group 411. American Financial Group Michelle A. Gillis, Senior Vice President and Chief Administrative Officer Angela Talton Nielsen Company, Chief Diversity Officer Talton joined Nielsen in 2007, and with her leadership as CDO, the company was named to DiversityInc's Top 50 Companies for Diver- sity and Diversity MBA's Best Companies for Diversity and Inclusion, as well as achieving a score of 100 on the Human Rights Campaign Corporate Equality Index. 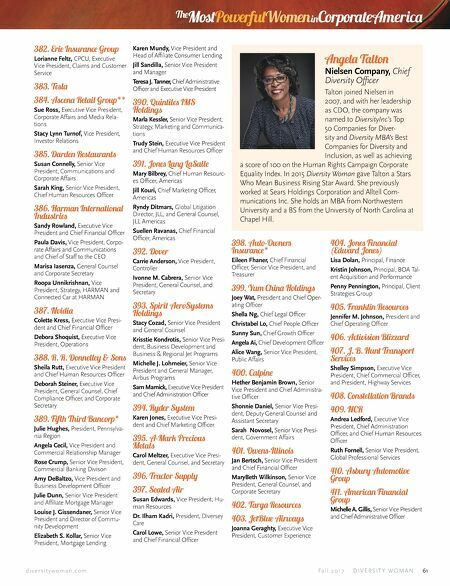 In 2015 Diversity Woman gave Talton a Stars Who Mean Business Rising Star Award. She previously worked at Sears Holdings Corporation and Alltell Com- munications Inc. She holds an MBA from Northwestern University and a BS from the University of North Carolina at Chapel Hill.